In November he visited Mexican President Enrique Pe-a Nieto in an effort to strengthen diplomatic relations and create conditions allowing for increased Mexican investment in Cuba. This could help both countries as each has much to offer in terms of natural resources and willing investors. South Africa has expressed similar interest in expanding its investment in Cuba. South African Deputy Minister Mzwandile Masina led a group of investors and exporters in November on a mission to Havana and expressed pleasure with Cuba's potential to absorb trade and investment. Most important was the U.S. presence at the fair. Among the companies attending, Sprint and PepsiCo showed great interest in doing business in Cuba. Because of President Barack Obama's gradual chipping away at the embargo by creating a telecommunications exemption, Cuba has signed a roaming agreement with Sprint Corporation “to allow customers…to easily make wireless connections when in Cuba,” according to Computerworld, which noted that the agreement followed a similar one with Verizon.13 This signifies considerable progress between the two countries, but the only partially reduced embargo still hampers U.S.-Cuban trade and investment. Provision of services by U.S. companies like Sprint would represent a big opportunity for both countries. Not only is the United States a world leader in the supply of advanced technologies and a major source of investment flows, but the fact that its companies account for nearly a quarter of world imports makes it a crucial potential partner for Cuba.14 Cuba realizes the importance of large U.S. investors, but many compromises are necessary for significant progress in fully ending the commercial, economic and financial embargo. Cuba would benefit immensely from the lifting of barriers like restrictions on U.S. companies' ability to invest and receive imports from industries outside of agriculture and medicine and to make incentivizing credit terms on imports and exports. But until it satisfies provisions of the Helms-Burton Act Congress is unlikely to lift the embargo. Cuban obligations under the 1996 act include transitioning to a democratically-elected government, reimbursing for expropriations made during the Cold War, and releasing all political prisoners in Cuban jails. Kansas Wheat Commissioner Doug Keesling, a farmer himself, referred to the U.S. government’s excessive entanglement in Cuban-U.S. trade relations and its tendency to deter businesses from Cuba. He says U.S. “regulations and statutes … make U.S. wheat too expensive to compete with wheat from Canada and the European Union in the Cuban market…. The law requires that exporters receive cash before they're allowed to unload in a Cuban port. "18 Requiring cash hand over fist in Cuban ports makes it difficult for businesses because most Cuban purchasers do not have sufficient cash and must take out loans, which the Cuban government prevents Cuban businesses from doing with U.S. lenders. Will this principle prolong the embargo’s existence? Washington has left the ball in Havana's court by making significant reductions in the embargo and has eased diplomatic relations by reopening its embassy in Havana. It now awaits Cuba’s response. Hanging in the balance are opportunities from one of Cuba’s largest and most potentially beneficial trade partners. Another key question is how Cuba will maintain solidarity with other Latin American nations while moving forward as a developing economy in the world. For the past ten years Cuba has been a member of the ALBA-TCP (Bolivarian Alliance for the Peoples of our America), originally created to help members confront the power of developed countries such as the United States by providing an alternative to the conventional capitalist trade models of privatization and globalization.22 Cuba's ALBA-TCP membership is another indication of its reluctance to be dependent on global capital markets that do not further its revolutionary goals. In the past, Cuba has rejected these institutions and interventionist agreements, mostly on the basis that their practices are incompatible with its socialist ideology. 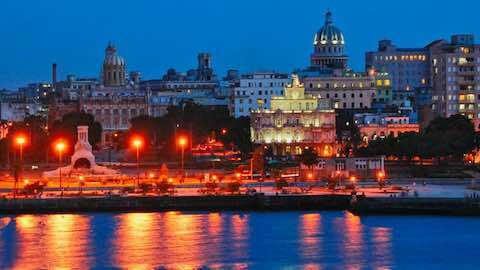 Over the next few months Cuba will show whether it maintains its solidarity with other nations in the ALBA-TCP while keeping itself open to opportunities present in IFIs and other foreign investment — and if so, how. As the United States continues to soften or eliminate sections of the embargo and as President Obama's tenure comes to end, Cuba must make decisions while there is momentum. Washington and Wall Street would like to see Cuba gradually open itself to global capital markets and show interest in IFIs, which could benefit Cuba in the long run and add needed momentum to end the embargo. Feinberg, Richard. “Cuba's Foreign Investment Invitation: Insights into Internal Struggles.” Brookings.edu. Brookings Institute, 21 Nov. 2015. Luis, Luis R., and Stephen Kosack. “Cuba's Growth Strategy Features Human Capital and Foreign Investment: May It Work?” Ascecuba.org. ASCE: Association for the Study of the Cuban Economy, 19 Apr. 2014. Latin America: "Cuba's Dire Need for Foreign Investment"